To have the Grand Rapids, Mich., police tell it, they don’t know the difference between an 11-year-old black girl and a 40-year-old white woman. 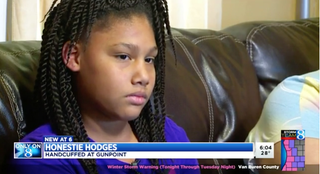 At least, that’s the excuse police offered for why they handcuffed and held 11-year-old Honestie Hodges at gunpoint Wednesday. Now the Grand Rapids Police Department is launching an internal investigation into what happened on Dec. 6, when Honestie ended up in the back of a police car as the police searched for an attempted murder suspect—Honestie’s aunt Carrie Manning, who, as we mentioned before, is white. At a press conference Tuesday, Grand Rapids Police Chief David Rahinsky showed police bodycam video from the incident, WOOD-TV reports. The video is dark and some of the picture is difficult to see, but according to WOOD-TV, the footage shows officers walking Honestie backward with her hands up and then handcuffing her. After she’s patted down, she’s put in the back of the police cruiser. The whole time, she can be heard screaming. Chief Rahinsky said that hearing the girl’s screams made him feel nauseated. “They go to your heart,” Rahinsky said as the tape was played. “You hear the mother yelling from the steps, ‘That’s my child!’ That’s our community’s child. That’s someone who lives in Grand Rapids. That’s someone who should feel safe running to an officer. Grand Rapids officers arrested the Stocking Elementary School student on Wednesday while searching her home for Manning. Manning had allegedly stabbed her younger sister at her own home, a few blocks away from Honestie’s house. According to an earlier WOOD-TV report, Honestie was leaving through the back door of her house when she was met by the officers. Despite the fact that Honestie’s mother, Whitney, pleaded with the cops not to handcuff her 11-year-old daughter, the police officers arrested her anyway, along with two other women who had left the house. “When my mom was walking past, I was putting my hands through the little bars, banging on the windows, screaming, ‘Please don’t let them take me,’” Honestie told the TV news outlet. On Monday, the Grand Rapids Police Department said that the officers detained Honestie and the two women because they hadn’t determined that “none of them were the suspect and that they weren’t armed,” according to WOOD-TV. “I’m just wondering why they did that to me,” Honestie said.